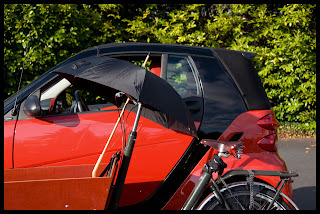 Welcome to Part Two of the Smart/Bakfiets Comparison. We already looked at the raw measurements, now let's put some of the features of each side-by-side. 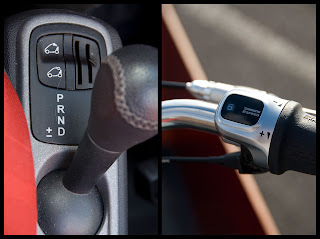 A 5-speed automated manual transmission keeps the Smart moving briskly down the road. 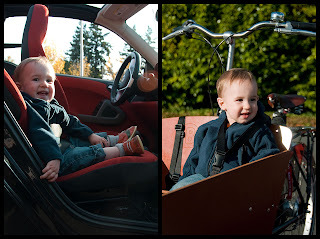 Not to be outdone, the Bakfiets features 8 speeds. Notably missing from the Bakfiets is a reverse gear. Both vehicles are rear-wheel drive, and both feature a fully-enclosed drivetrain. The Smart rolls along on four 15-inch alloy wheels. 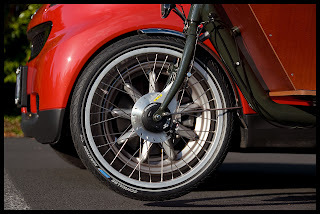 The Bakfiets has a 20-inch wheel in the front and a 26 inch wheel in the rear, each with 36 12-gauge stainless steel spokes. 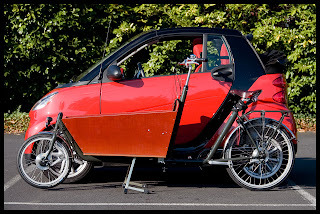 The Smart has one passenger seat, while the Bakfiets comes standard with a bench for two. 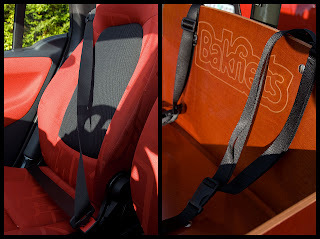 A standard lap-shoulder belt keeps the Smart passenger secure; 3-point harnesses do the same in the Bakfiets. The Bakfiets has the option for an additional bench in the cargo box, providing the ability to carry 4 children (or more if you put some on the rear rack). You could probably fit 4 kids into the Smart, but the State may frown upon it. 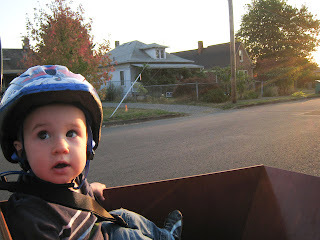 The cargo box on the Bakfiets is rated at 180 pounds, and the rear rack (not pictured) at 70 pounds. 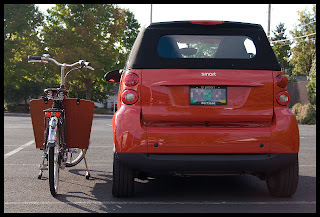 The Smart has neither a cargo box nor a rear rack, but it does have some space behind the seats that could probably carry the same amount. 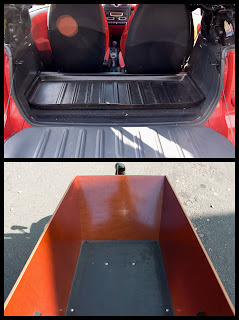 However, the back of the Smart is not as amenable to hosing out when it gets dirty as the cargo box on the Bakfiets. The Smart and the Bakfiets each have two pedals. 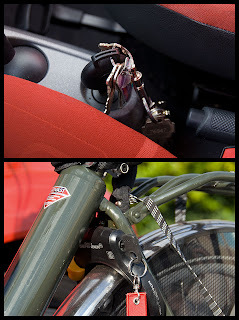 On the Smart, one is for going and the other for stopping. 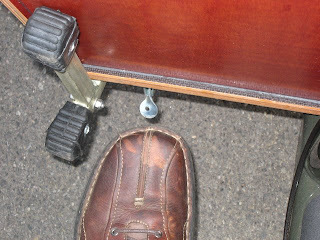 On the Bakfiets, both pedals are dedicated to going. 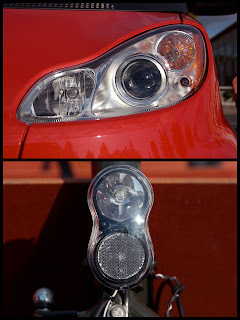 The Smart powers its lighting with a standard automotive battery, while the Bakfiets uses a generator integrated into the front hub. The Smart surpasses the Bakfiets in comforts and amenities like a stereo, heating, lumbar support, etc. 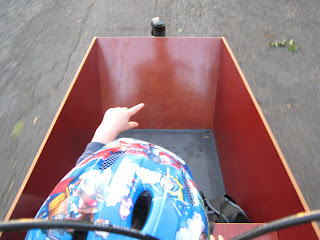 However, the Bakfiets makes up for it with a high-volume ventilation system and better visibility. 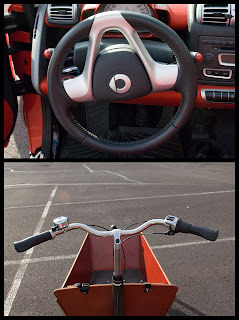 Both vehicles require a key for use — the Smart for ignition and the Bakfiets to unlock the rear wheel. 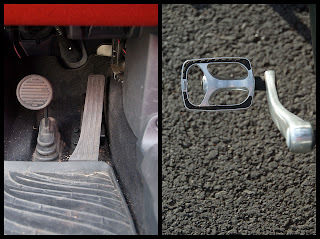 Both are below the drivers seat/saddle, rather than being on the steering column. What do you do in the Smart convertible when the rain starts? Put up the roof. In the Bakfiets? It's umbrella time. Thanks again to Darrel for bringing his Smart over to play. Huge bikes and tiny cars, what a great combination! 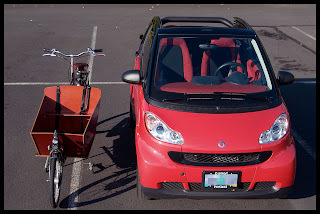 Welcome to part one in a series comparing the Bakfiets cargo bike to the Smart fortwo convertible. Interestingly, these two head-turning vehicles are about the same length and have similar cargo capacities. What other attributes do they share? What are some of the differences? I invited my friend Darrel to bring his Smart over for a photo shoot, and he was glad to oblige. The Smart measures 106 inches. The Bakfiets is close at 101 inches. 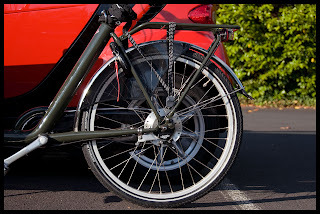 The wheelbase on the Smart is 73 inches, compared to 77 inches on the Bakfiets. I didn't get a good picture, but I think the Bakfiets has more ground clearance (as long as the pedals are in the right position). The Smart's width is 61 inches. The Bakfiets is 27 inches from handlebar end to handlebar end. Stay tuned for the next thrilling episode: feature comparisons. It's already been more than a month since I rode the Bakfiets home, so it was time to head in for a tune-up. The only real problem that's come up is that two weeks ago something happened in the rear hub, and 4th and 8th gear ended up completely out of sequence. 4th had the resistance of somewhere around 1st, and 8th was down around where 4th should be. Going from 3rd to 4th was like downshifting, and my legs would completely spin out. Wanting to give Sara a few precious hours of time to herself, Everett and I bundled up for the trip in to Portland, hoping to arrive at Clever Cycles when they opened. I planned on a two hour ride, so we left just after 9am. It was cool and foggy when we left, but the great thing about having a bike like this is you don't need to worry about where you'll put your extra layers when they come off! My estimate was about right — the total ride time was two and a quarter hours, time-in-motion was an hour and a half*. The difference can be explained by a short Cheerio-and-leftover-pancake picnic and a stop to watch some birds on the river. *I know this because I'm a geek and brought my handheld GPS. I'd never check it while riding, but it's fun to look at afterwards. We arrived, handed over the bike, and met Sara, who had driven over after enjoying a leisurely, kid-free morning reading the Sunday paper. Todd at Clever explained that they'd never seen that particular problem before with 4th and 8th gear. I feel so special and unique! It's all fixed now, but you'd have to ask him if you want any more detail. The bike was ready around 5, but due to the increasingly early sunset here, I borrowed my neighbor's pickup to get the bike back home. What a nerve-wracking trip! 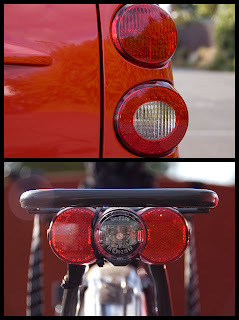 I think I spent more time checking in the rear-view mirror that the bike was still there than I did looking ahead. I've recently noticed a certain wear pattern to my left shoe that I haven't seen before. I wonder what that scuff could be from. This is Everett, my son and co-pilot in cargobike travels. He's just over thirteen months old, and is the main reason we got the bike. I wanted to be able to share rides with him, to talk (even though he isn't yet), to point things out to him, and allow him to do the same. I like to think the bike was his first birthday present, because it was on his birthday while we were setting up for the party that Clever Cycles called to say they were ready to take a deposit. We go cruising on the weekends, sometimes to a distant park for a picnic, looking for garage sales, or down to the Farmer's Market. It's nice to know that if we find something good at a garage sale or the market, we'll be able to bring it home with us. On weekday evenings we'll just ride around for the heck of it. When we ride, he has made it his duty to point out every cat, dog, bird, or squirrel that might cross our path. Look, there's one now! He also points out the airplanes in the sky, but I'm pretty sure there's no risk of collision there. After only about a month, he's already a big fan of the bike (aren't we all? 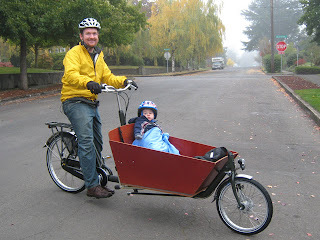 ), and on a recent trip to Seattle he spotted a Bakfiets on the road and excitedly pointed it out to us. We're hoping that by next spring Mom is comfortable enough on the bike to use it for transportation to all of their activities — like play dates and story time at the library — while I've got the car at work. 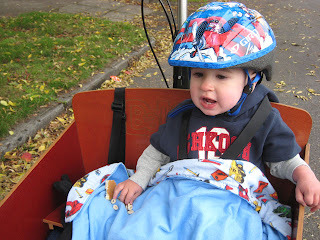 Then a few years later, the Bakfiets will carry Everett to school. For now, though, it's just me and him pedaling for fun while Mom rides alongside on her sweet sea-foam green cruiser.